The trial of Saddam Hussein and seven others has been adjourned for seven days to allow the defendants to replace two lawyers murdered in recent weeks. Most of the defence team did not carry out a threat to boycott the trial, after receiving security guarantees. As the case resumed, the court heard video evidence from its first witness - a deceased Iraqi intelligence officer. 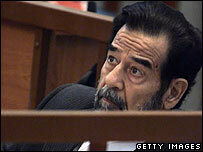 Saddam Hussein complained to the judge about his treatment. The defendants all deny charges of murder and torture. The charges concern the alleged massacre of 148 people, mostly men, in the largely Shia town of Dujail, some 60km (35 miles) north of Baghdad, in 1982. The killings followed a failed assassination attempt against the former Iraqi leader, Saddam Hussein. The first witness in the trial was Wadah Ismael al-Sheik, an Iraqi intelligence officer sent to Dujail to investigate the assassination attempt. In his testimony, taped before his recent death from cancer, Mr Sheikh said about 400 people were detained after the ambush, which was estimated to have been carried out by between seven and 12 assailants. He said whole families were rounded up and taken to Abu Ghraib prison in Baghdad, and another detention centre further south. He also said former Vice-President Taha Yassin Ramadan - also on trial - ordered Dujail's agricultural orchards to be destroyed, as that is where the attempted assassins had hidden. Saddam Hussein made a defiant appearance in court, complaining that he had to climb four floors to the courtroom because the lift was broken, and objecting to being escorted up the stairs by "foreign guards". He also argued with the judge, accusing him of giving up sovereignty to "foreigners, invaders, and occupiers". The BBC's Jon Leyne, in the courthouse, says Saddam Hussein appeared determined to stamp his authority on the proceedings. Another defendant, Awad Hamad al-Bandar, a former judge accused of ordering the deaths of many people in Dujail, complained that he and Saddam Hussein had been the subject of death threats in the court. Meanwhile Mr Ramadan, Saddam Hussein's half brother, complained he had not received proper medical treatment since being diagnosed with cancer and that this amounted to "indirect murder". As the trial resumed, after a gap of several weeks since it began in October, there were demonstrations both in Dujail and in Saddam Hussein's home town of Tikrit. In Dujail people called for the former president to be put to death. 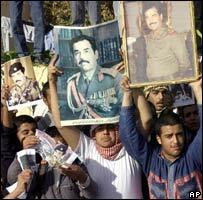 "We ask for the execution of the infidel Saddam and his corrupted followers," said a banner carried by protesters. Meanwhile a crowd of people marched to the village of Awja, Saddam Hussein's birthplace, from the Sunni town of Tikrit, holding photographs of the former leader and chanting "Yes! Yes! to Saddam." The BBC's John Simpson says the former president seems to have his eyes on martyrdom, and that with his defiance in court, even those Sunni Muslims who did not support him when he was in power, tend now to regard him with some sentiment and warmth. Also in court on Monday, seated alongside the defence team, was former US attorney general Ramsey Clark, an outspoken critic of the trial. Mr Clark, 77, later told the BBC that the trial could not proceed when there was no adequate protection for defence lawyers and witnesses. On 8 November two defence lawyers were shot in their car - one died. On 20 October one of their colleagues had been abducted from his office and was later found dead.